According to writer Patrick Lencioni, there are five basic dysfunctions that teams commonly struggle with. They explain why building trust is one of the most important and fundamental things you must do to become a high performing team. One of the key things we look at when we go into any organisation is team dynamics. Especially the dynamics and patterns in the leadership team. Because these patterns cascade down the organisation, causing all sorts of effects. It’s isomorphic: what happens in one place happens in another place. If the leadership team is high performing, all well and good. But all too often we’re called in to help because they’re not. And the reason they’re not high performing can usually be traced back to the relationships between team members. Business writer, Patrick Lencioni has a model that explains why relationship dynamics in leadership teams are so important. It’s a model we refer to a lot. 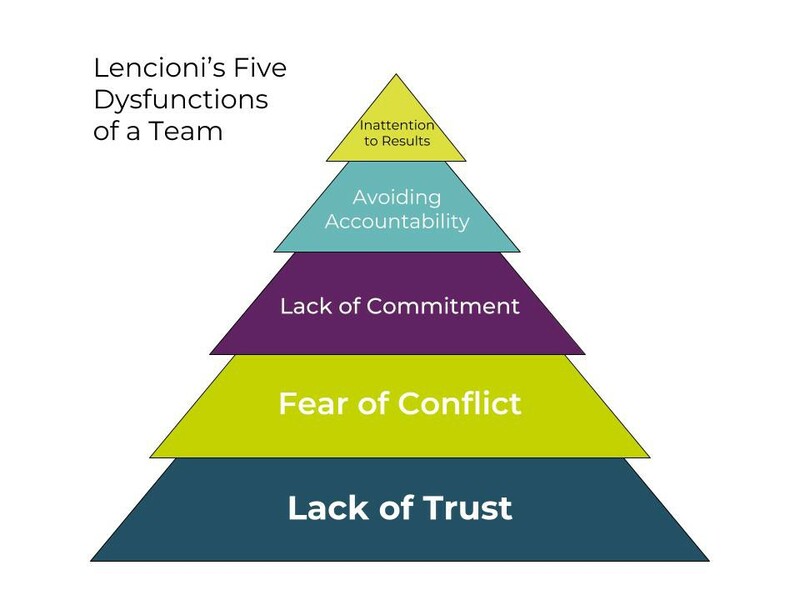 According to Lencioni, there are five basic dysfunctions that teams commonly struggle with. These cause confusion, misunderstanding, negative morale and can impact entire organisations. The root cause of lack of trust lies with team members being unable to be vulnerable and open with one another. This is a huge waste of time and energy, as team members invest in defensive behaviour instead, and are reluctant to ask for help from — or assist — each other. 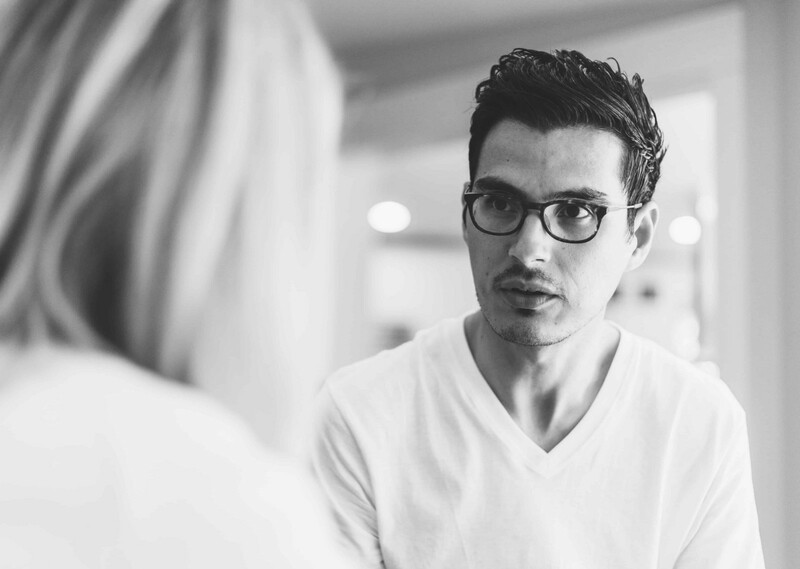 Teams that are lacking trust are incapable of having an unfiltered, passionate debate about things that matter, causing team members to avoid conflict, replacing it with an artificial harmony. Without conflict, it is not easy for team members to commit and buy-in to decisions, resulting in an environment where ambiguity prevails. When teams don’t commit, you can’t have accountability: “people aren’t going to hold each other accountable if they haven’t clearly bought into the plan”. A team can only become results-oriented when all team members place the team’s results first. When individuals aren’t held accountable, team members naturally tend to look out for their own interests, rather than the interests of the team. If your leadership team is struggling, it can often be traced back to these behaviours. What we find when we first work with teams is that everybody always says, “we’re good at collaborating,” but many groups are bouncing up and down between being good at working as a team, and avoiding conflict (ie preserving the status quo, which is rooted in a lack of trust) all the time. If you can work on this stuff, your performance as a team will go to a whole other level. There’s a big leap you can make: if you can get better at developing skills to counter the dysfunctions, and change the patterns and the problems, you will build confidence and capability, become much more effective, better at collaborating, and your organisation will benefit. It’s a slow process, but it’s worth the effort and can yield big results. We’ve been working with one of the leadership teams within a large organisation. They were a team of 15 people. All of the core functions and pillars were represented in this group: marketing, research, frontline delivery, finance, HR, administration, and more. We’d been hired to help the group look at how they could work more together effectively, to strengthen their performance, and become a high performing team. It so happened that they were working on an initiative to form networks of a whole range of colleagues at different levels, that they could use to cross-fertilise through the organisation. There was a very earnest belief that this would be useful, and that by doing this they could dramatically improve the effectiveness of the organisation. But you can’t legislate for how people will work within networks. They were wise enough to recognise that. The network project was interesting but for us, the real work was: how do we use that project as a proxy to help the leadership group reflect on how they operate as a team, especially as all kinds of interesting things happened in their attempts to do it. So we ran a series of workshops that they coordinated and pulled together. We helped them design the agendas, and we helped them facilitate the sessions. Although the intention for forming the networks was clear, to get real connectivity in each network required its participants to step into an ambiguous space. They needed to have the freedom and permission to shape the network in ways that were beneficial for them. And indirectly, therefore, for the organisation. This was pretty high level. It’s not very directive. But people don’t always operate well in ambiguous spaces. In the first network meetings, the leaders discovered low levels of trust and a lot of discomfort. There were real question marks for some people as to why they were there, and some walked out because they didn’t feel it was valuable or relevant to them. It became apparent that there was a dearth of skills around hosting meetings, and how to create a space where people felt comfortable enough to uncross their arms and contribute. At the meta level, the process shed real light on how the leadership team was functioning. In the end, it all came good, but to get them there we kicked off with a session around what a high performing team might feel like, and what they felt their dynamic was, including some self-diagnosis. Six months later, we tailed it with another session on how the network formations were going, which began very industriously because everyone was reflecting on the success of their experiments. But when we paused the latter session and asked, “What does it reveal to you about the way that your group functions as a team?” People found that much harder. So we worked with them on Lencioni’s 5 dysfunctions of a team model. Unsurprisingly they all thought they were doing quite well, and to be fair, we did observe quite a significant shift from six months previously, in the way that they were interacting with each other. There was a lot more engagement in the conversation, a lot more active listening, a lot more freedom to speak, a lot less guardedness. You could see that trust had built in this group in that period of time. But when we pushed that further, none of them talked about the tensions that had emerged during the network project. Tensions that we were privy to because we were witnessing and observing them. This group were doing all they could to stay in a safe place and were shying away from conflict. And by conflict, we don’t mean aggression, or people shouting at each other. Conflict is a very nuanced thing. We mean unease, tensions, the bits that aren’t vocalised but are there nonetheless. It had been particularly noticeable during one timelining exercise early on in the process. One of the contributors had talked about how a normally joyous and significant life event was instead an awful, and dangerous one. “There was a moment when I did not know whether it was going to be okay. I was getting ready for terror,” they said. It was the rawest moment of the day. Yet everyone went quiet, and we moved away from it. Not because they were frightened of the emotion, but because it felt like they needed to protect this person from it. As facilitators, we needed to call this out. So we asked the group to talk about the tensions that had emerged in doing the network project. But what they shared was mostly high-level about the organisation. The conflicts and the dynamics that had become all too obvious were still not talked about. There were riskier conversations to be had, so we called it out again. And slowly the penny started to drop. “Is anybody willing to take a risk? Right now? In this group?” we asked. Nervous laughter. Everyone knew what they were talking about. At this point, the manager chipped in. People described how it had gone from okay to not okay in about 3 seconds. Until the Manager had intervened, smoothed it over, and everything became okay again, and safe… except it wasn’t. As we went round the group, some were still worried about it and were still carrying the shock of that moment, even though it wasn’t even extreme. No one had shouted. The tension that remained wasn’t over the frustration, it was that they had visibly got upset with each other. What was the experience of talking and sharing these perspectives with the group? We said, “No! Don’t say that! We’re not criticising what you did, what we’re really diagnosing are the implications of the group’s inability to handle a basic emotional response. Not that you did it. It was a breakthrough moment for this group. The first example of the group collectively reflecting on an emotional experience, and demonstrating trust — because everyone talked about it and explored the conflict. On one level it was a tiny thing, but symbolically it was huge — they were practising something very important. An ability to deal with conflict. This is an example of trust building, conflict resolving, and sharing understanding that leads to a virtuous circle and a leap in performance. It was a really important thing to talk about. Originally published at www.thensomehow.com on March 5, 2019. We invent, pilot and help deploy tools and programmes that help organisations become better places to work. We help people make informed decisions, and change behaviours that support improved cultures.All our tools have data and stories, logic and magic, at their heart.